Mid December 2017, I published two blogs on Power dimensions and Danger zones in relation to international countries (part 1) and the European Union (part 2). Part 3 is about my home country, the Netherlands. The (relative) absence of center parties explains the longest ever Dutch government formation talks - with 225 days (eg, Guardian, NL Times, Wiki). The X-axis has been slightly amended to reflect both Nationalism and/or State (left) and Globalism and/or Market (right). 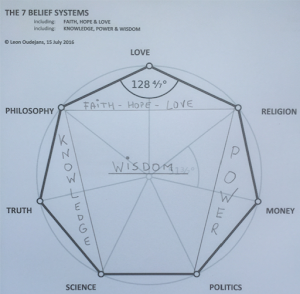 The Y-axis has also been slightly amended to reflect Community and/or Religion (top) and Liberalism and/or Secularism (bottom). The yellow circle reflects the decreasing number of center parties. Most Dutch political parties reflect strong - rather than extreme - views. In my view, the above diagram is also applicable to Germany and thus also explains the longest ever German cabinet formation talks. My 25 September 2017 blog, A Dutch lesson for Germany, already expected a Dutch copycat in Germany. The X-axis does not reflect the classical Left - Right divide as this divide belongs to the previous 2 centuries (1800-2000). Since about 2000, there is a new divide between Globalism vs Nationalism (my blogs). The UK is the last major European country that is still making up its mind about the old and the new divide. The Brexit debate is drawing the new lines in UK politics. 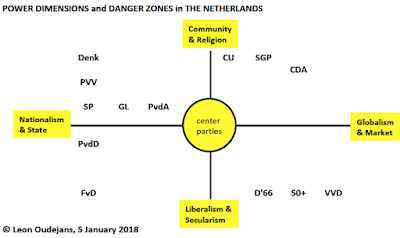 The current Dutch Cabinet has 4 parties at the right of the Y-axis (ie, CDA, CU, D'66 and VVD) of which 2 are Christian and 2 are Liberal. Its fault line is the X-axis due to the libertarian and activist views of D'66 on medical-ethical and philosophical issues, like abortion (eg, D'66, NOS), the end-of-life / right-to-die pill (eg, Dutch News), and the industrial production of babies (eg, D'66, FD). 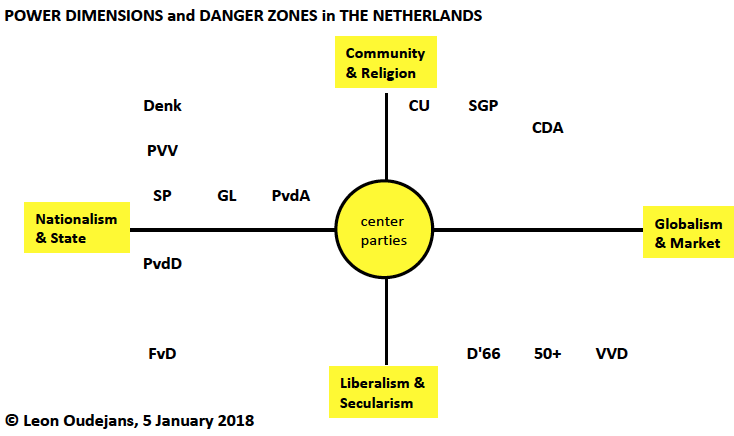 Another striking feature is the situation at the far left of the Y-axis: 5 nationalist parties with rather extreme Dutch views, being the nationalist Animal Party, the libertarian and nationalist Forum for Democracy, the anti-Islam and nationalist Freedom Party of Geert Wilders, the nationalist pro-Erdogan-Islam-Turkey party, and the nationalist Socialist Party. The failure to integrate GreenLeft (GL) in the Dutch Cabinet formation makes sense following the above diagram. Late November 2017, a similar failure happened in Germany (eg, DW-1, DW-2).